I have decided it is time for me to stop letting all my stress and work keep me from taking the time to blog. Yes, my blog is sort of part of my work, but it is also something I enjoy and miss. I have done Wordless Wednesday in the past, but since I am usually wordy in my posts about them, I have decided to go to a more “wordful” route! This week, I posted the picture below on Facebook of Sissy Girl in her chef costume. However, this is not just a chef costume to Sissy. This is her uniform, and in her mind, she was not playing. She was training. My daughter has wanted to be a chef since about age 2. She is 6 now and is helping more in the kitchen. However, what makes her a little different from most little helpers in the kitchen is that she loves to read cookbooks. She has one that she took to bed tonight. She is also asking questions. Tonight she asked me how long to cook pasta because she made macaroni and cheese today and wanted to make sure that when she makes it for her customers someday that it will be perfect. The kid has her whole idea for her restaurant and will tell anyone who will listen. She even has a name for it, and she is excited that someday she will open her own business. It is times like these that make it worth it in building my own business because it gives my daughter the ambition to someday build her own. 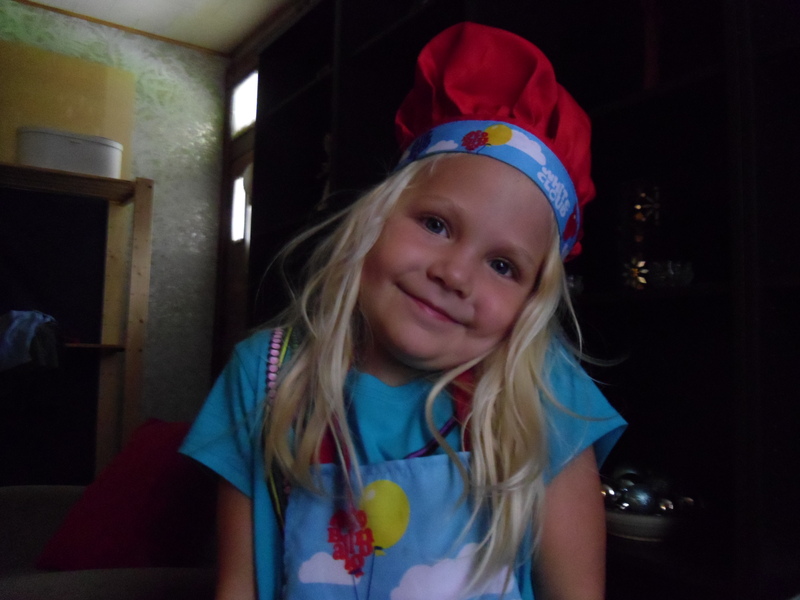 I have no doubt that she will be a successful chef if she puts her mind to it, and I cannot wait to eat at her restaurant! She’s so cute! I just found you via the MBC, and I’d love for you to come link up to the Mommy-Brain Mixer blog hop! http://www.two-in-diapers.blogspot.com/2012/09/mommy-brain-mixer-7.html. Tons of great moms linked up and LOTS of fun!